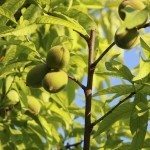 My peach trees bear plenty of fruit in the spring but never reach maturity. Fruit begins to produce a lot of sap on the fruit itself and then falls from the tree. What can I do to stop this?